The Newman’s Own family of food and beverage products stand for things we love: simplicity, quality and modesty. 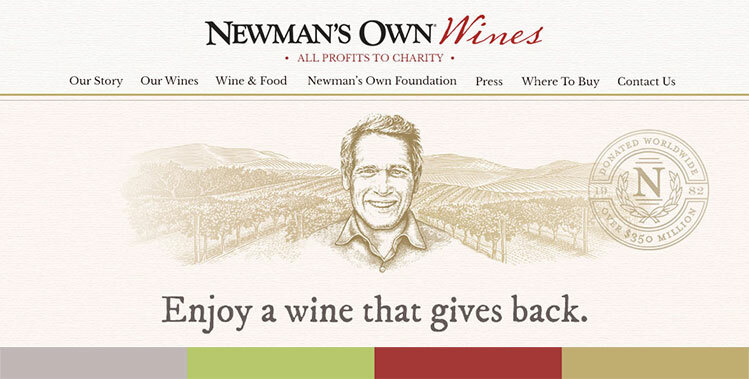 When Newman’s Own Wines launched in 2009, we were proud to bring the brand to life on the web. When they updated the brand to reflect the quality of the wine, we jumped at the chance to re-imagine a digital experience for the brand. 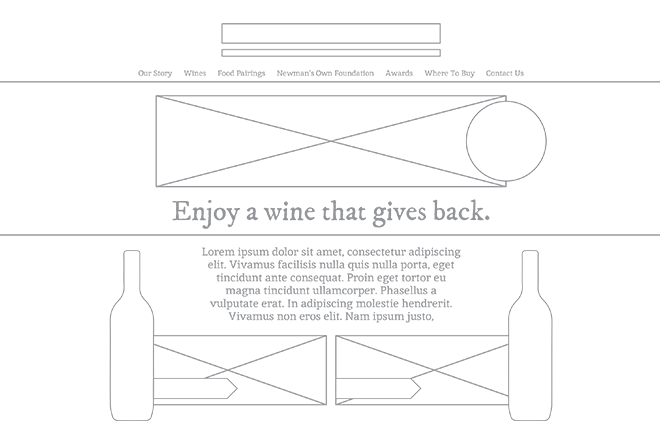 The Newman’s Own Wines brand launched with simple, playful branding that helped create an accessible new wine product in a competitive marketplace. After four years of success however, Newman’s Own was ready to evolve the wine brand to reflect the quality inside the bottle. At the same time, it needed to retain the brand “feel" of casual simplicity and unpretentiousness. Every Daylight design carries the brand’s character across the entire web experience. To create a more refined experience in this case, we reviewed the existing product content, recipes, images and other assets. The new brand content carried a more mature tone, so we elevated the new information architecture and navigation to fit this style. Then we structured the new content and assets to reflect a more elegant brand, while retaining its simplicity and authenticity. We developed a new visual library of images, fonts and navigation patterns for the design to inform the entire site. We focused more on product images of the wine, and fewer images of Paul, the brand’s founder and namesake. We also incorporated new farm-to-table imagery to connect the brand with the broad family of Newman’s Own products made from quality ingredients and simple, natural recipes. To modernize the site and give it legs across multiple devices, we designed and developed every page with responsive style sheets, so the site adjusts perfectly for any size device or screen. 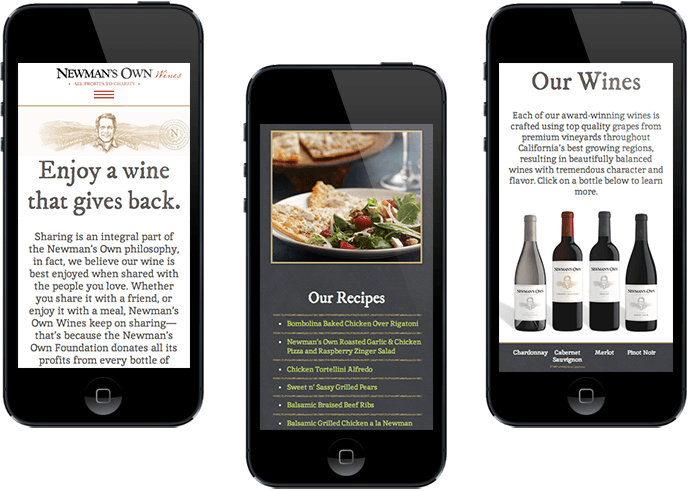 We also made sure "sharable content" like recipes and wines featured photos for posting to Pinterest, Facebook and other social media. 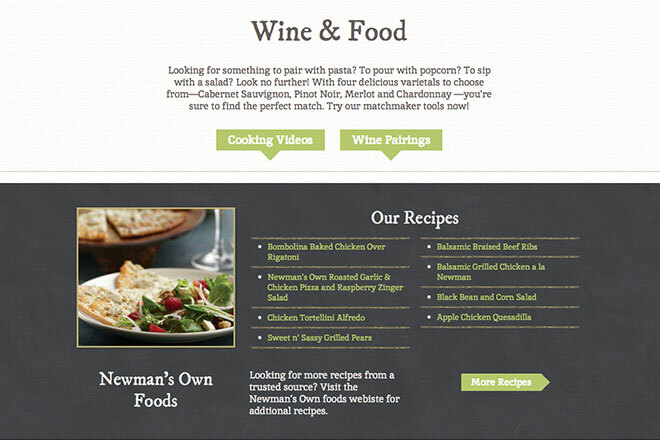 The rejuvenated Newman’s Own Wines site reflects the brand's current and future goals, creating an impression of simple elegance that’s not out of reach.